Over the past three years, part of Pope Francis' papal duties seemed to be keeping up with this amorphous technological world. The pontiff tweets regularly from nine different Twitter accounts; has used Google Hangouts to connect with schoolchildren from Turkey to South Africa; and once called the Internet "a gift from God." Yet Francis was missing from one of the most popular social media platforms — the one that seemed most fit for his sunny, selfie-loving demeanor. On Saturday, Pope Francis posted his first photo on Instagram, garnering more than 40,200 likes in two hours. 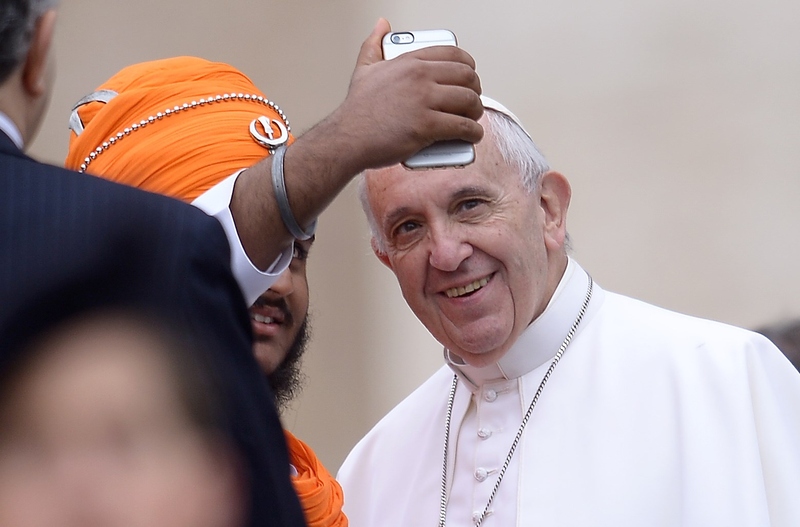 Sorry, folks: the pontiff's first Instagram post is not a #selfie. Instead, Francis uploaded a high-quality photo of himself kneeling in prayer, his head bowed and eyes closed. Francis captioned the photo "Pray for me" in nine different languages: French, Polish, and Arabic among them. For his username, the pontiff chose Franciscus, which is Latin for Francis. Instagram will help recount the Papacy through images, to enable all those who wish to accompany and know more about Pope Francis’ pontificate to encounter his gestures of tenderness and mercy. We will choose photographs from the Photographic Service of L’Osservatore Romano, selecting certain details. In this way we can show those aspects of closeness and inclusion that Pope Francis lives every day. Francis also tweeted his Instagram announcement on his various Twitter accounts, writing: "I am beginning a new journey, on Instagram, to walk with you along the path of mercy and the tenderness of God." According to the Vatican, it's no coincidence that Francis decided to launch his Instagram account during the Jubilee Year of Mercy, a special year designated for forgiveness and inclusion within the Catholic Church. The pontiff is planning on using social media to promote this year of mercy and connect with Catholics and non-Catholics alike around the globe. It seems like Francis has already won over one non-Catholic: On Saturday, Facebook founder Mark Zuckerberg welcomed Francis to Instagram, writing that people of all faiths can be "inspired by Pope Francis’s humility and compassion." Welcome to Instagram, Francis. We are all truly #blessed by your presence.